Sharp Magazine is one of my favorite themes that was designed by Charlie early last year and it didn’t take long to become of one of our top sellers. 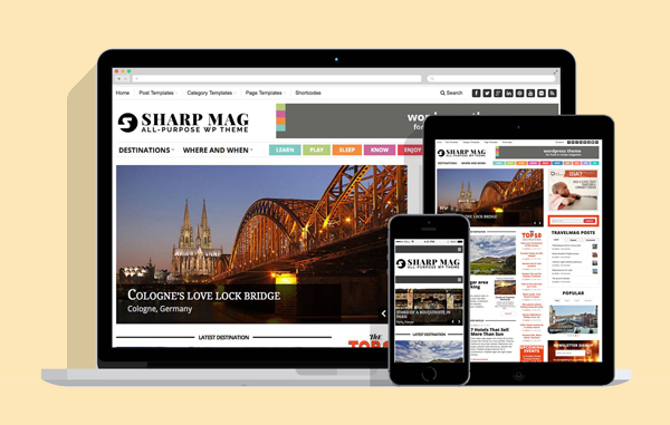 Sharp was built up with a lot of unique features including but not limited to colored navigation, newsletter signup widget, large sidebar ads, infinite colors, elegant footer as well as homepage, category & post templates. While there was no need to update it, we still wanted to sharpen and make it even a better theme than it was. But as usual, the list of features that we wanted to add got expanded along the way and at the end, there was almost not a single file that was not edited. Now with the new version of Sharp, you will have WooCommerce which would let you to set up an online store in no time. The new version also comes with new framework that features a better performance and media handling along with HTML5 video support that also can display custom subtitles. The responsiveness of theme as well has been improved to make sure that it looks good on every mobile devices. Send us your feedback on the forums or below as comment.